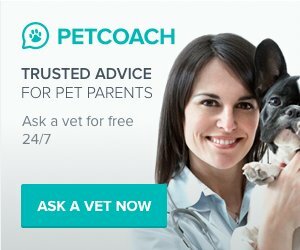 Dog skin pimples caused by a mast cell tumor are usually on the back half of the dog. They can be malignant tumor (50% are cancerous). Mast cells which are the cells believed to be the cause of Type I hypersensitivity (hay-fever, seasonal allergy or atopy). These types of tumors represent 20% of tumors found on dog skin. The tumors are usually seen in dogs age 9 or older. These types of tumors vary in appearance. 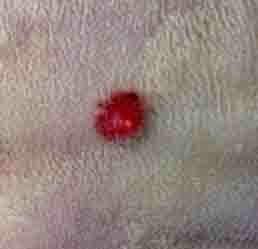 Most tumors are ulcerated , red and hairless. It is possible that the tumor doesn't change for years, and then starts all of a sudden to grow. Since most tumors release a chemical called histamine, an accompanying symptoms is dogs presenting with an ulcer. A diagnosis is made with either a biopsy (testing of a skin sample) or the testing of a skin sample (cytology). The appearance alone does not indicate if a tumor is benign or malignant. The veterinarian will determine the tumors "stage" based on size. Depending on the stage treatment may be limited to surgical removal, or include radiation or chemotherapy.